Today I downloaded the first 3 Chapters Audio MP3 files from the Old Ramana Ashram site .It is yet to be uploaded in the new Ashram website . The tamil rendering is clear but would have loved a chorus chanting as done with the Bhagwan's Tamil Works . My son was born in september 2012. We wish to name him after bhagavan, his teaching, devotees or arunachala. I have been having a tough time thinking of names that would have relevance to bhagavan, arunachala and his teachings. The name, ideally should start with the letter 'k'. Would be very happy if you could provide me with some inputs. Humour / Puzzle 5 :What is the next number in this sequence ? What is the next number in this sequence ? Humour / Re: Puzzle 4 : Who am I ? Humour / Puzzle 4 : Who am I ? I am a 7 letter word. If i remove one letter from it , still it remains the same. If i remove ten more letter from it , still it remains the same. If i remove twenty more letter from it , still it remains the same. Strangely when i remove all letters from it , still it remains the same. V. Subramanian's issues, I have no idea. In one line you say Sri Ganesan is a bachelor and in another line you say he has 2 sons . Is it VS Ramanan's 2 sons? General Discussion / Re: Sankranti / Pongal Greetings for 14.01.2013. General topics / Re: Swami Vivekananda's 150th Birth Anniversary - 12.01.2013. 12. The 54 Lives Saved by Annai Saradamaball! to Kanchi, have darshan of PeriyavaaL and then continue our journey. reach the place before sAyarakSai (evening)." doing our saMkalpa snAnam there, why not go to Sringeri later?" wheels with the punctured tyres and fixing the Stepney wheels in their place. Hunger pinched our stomach; our last meal was at noon in Bagamandala. on the road that branched to the right." It gave us a shock! PeriyavaaLe, Ramachandra Murtiye, save us, save us...!" vehicle stands intact! Now no worry at all. Shall turn the bus in a few moments"
and started on his efforts. We did not stop the nAma ghoSaNam. Uppuma and Bringal Gotsu are ready!" all that I have come to stand here and receive you all!" He sunk us in surprise. food filling up our stomach. darshan of Maha Sannidhanam Sri Sri Sri Abhinava Vidyatheertha SwamigaL. The SastrigaL we met last night was seen by us. (news) in the morning. I pray that you please tell it now." on the walls. Now everything is alright, and the bus is coming towards Sringeri! fact of our not following what Sri Kanchi Periyavaa ordered for us! Could you please tell me how I can book a room in the Ashram? Thanks for sharing the beautiful incident of Kanchi Mahaswamigal . Abstinence from injuries and killing , being established , all hostilities are given up in the presence of the practitioner . 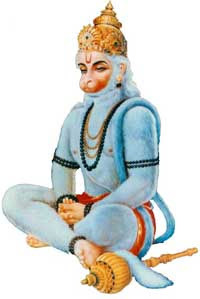 Hanuman Jayanthi is observed during various time of year by different Hindu communities. Majority of the people observe it in the Chaitra month (March - April). In 2013, Hanuman Jayanti, or Hanumantha Jayanthi, in Tamil Month Margazhi is on January 11. In Tamil Nadu, it is observed in the Margazhi month or Margali Masam, which is one of the most auspicious months in Tamil Calendar. It is widely believed that Lord Hanuman is present where the story of Lord Ram is recited. Therefore people read the Ramayana on the day or recite prayers dedicated to Rama. The Sundara Kandam chapter of Ramayana is read by most people.Special prayers are held on the day in Hanuman Temples and are visited by large number of devotees. At home, idols or pictures of Hanuman are thoroughly cleaned at dawn. Idols and pictures are smeared with Sindhoor. Sweets and bananas are offered to Hanuman. SRI HANUMAN is worshipped all over Indiaâ€”either alone or together with Sri Rama. Every temple of Sri Rama has the murti or idol of Sri Hanuman. Hanuman was the Avatara of Lord Siva. He was born of the Wind-God and Anjani Devi. He is also called by the names Pavanasuta, Marutsuta, Mahavira, Bajrangabali and Pavankumar. Hanuman was the living embodiment of the power of Ram-Nam. He was an ideal selfless worker, a true Karma Yogi who worked desirelessly. He was a great devotee and an exceptional Brahmachari or celibate. He served Sri Rama with pure love and devotion, without expecting any fruit in return. He lived only to serve Sri Rama. He was humble, brave and wise. He possessed all the divine virtues. He did what others could not doâ€”crossing the ocean simply by uttering Ram-Nam, burning the demon-king's city of Lanka, and bringing the sanjeevini herb to restore the life of Lakshmana. He brought Sri Rama and Lakshmana from the nether world after killing Ahiravana. Hanuman possessed devotion, knowledge, spirit of selfless service, power of celibacy, and desirelessness. He never boasted of his bravery and intelligence. He said to Ravana, "I am a humble messenger of Sri Rama. I have come here to serve Sri Rama, to do His work. By the command of Sri Rama, I have come here. I am fearless by the Grace of Sri Rama. I am not afraid of death. I welcome it if it comes while serving Sri Rama." See how humble Hanuman was! How deep was his devotion to Sri Rama! He never said, "I am the brave Hanuman. I can do anything and everything." Sri Rama Himself said to Hanuman, "I am greatly indebted to you, O mighty hero. You did marvellous, superhuman deeds. You do not want anything in return. Sugriva has his kingdom restored to him. Angada has been made the crown prince. Vibhishana has become king of Lanka. But you have not asked for anything at any time. You threw away the precious garland of pearls given to you by Sita. How can I repay My debt of gratitude to you? I will always remain deeply indebted to you. I give you the boon of everlasting life. All will honour and worship you like Myself. Your idol will be placed at the door of My temple and you will be worshipped and honoured first. Whenever My stories are recited or glories sung, your glory will be sung before Mine. You will be able to do anything, even that which I will not be able to!" Thus did Sri Rama praise Hanuman when the latter returned to Him after finding Sita in Lanka. Hanuman was not a bit elated. He fell in prostration at the holy feet of Sri Rama. Sri Rama asked him, "O mighty hero, how did you cross the ocean?" Hanuman humbly replied, "By the power and glory of Thy Name, my Lord." Again Sri Rama asked, "How did you burn Lanka? How did you save yourself?" And Hanuman replied, "By Thy Grace, my Lord." What profound humility Hanuman embodied in himself! His birthday falls on Chaitra Shukla Purnimaâ€”the March-April full moon day. This post on Kanchi Maha Swamigal will be more useful if we read in the Context of the one posted above by me in Tamil . In the first post Kanchi Maha Swamigal request people to use their own Prayer altar at their house ( i.e their own Ishta Deivam ) to connect with the almighty and here he gives reason why for some people in spite of saying prayers regularly at home it does not work well . Periyava asks people to do the prayers sincerely sitting in front of the deity and doing the prayers with full concentration and not just mechanical repetition of the prayers while doing other house hold work . நேத்திக்கு ஒரு அம்மா சொன்னார். நான் நெறைய ஸ்லோகம் பாராயணம் பண்றேன்.மத்யானம் சாப்பிடவே ஒரு மணியாறது. ஆனா பிரச்சினைகள் தீரலேâ€¦பகவான் கண் பார்க்கலேன்னு வருத்தப்பட்டார். â€œஸ்லோகம் சொல்றச்சே சுவாமி முன்னாடி உட்கார்ந்துண்டு, சுவாமியை மனசிலே நிறுத்திண்டுதானே பாராயணம் பண்றேள்â€�னு கேட்டேன். â€œஅதெப்படி முடியும்? குளிச்சிண்டே,வேற வெலை பார்த்துண்டே தான் சொல்றேன்.எல்லாம் மனப்பாடம்.தப்பு வராதுâ€�ன்னா. காய் நறுக்கணும்னா அரிவாள்மணை,கத்தியைக் கிட்டே வைச்சுக்கறோம். சமைக்கணும்னா அடுப்பு கிட்டே போகணும். குளிக்கணும், துவைக்கணும்னா தண்ணீர் பக்கத்திலே போறோம். ஸ்கூட்டர், கார் எதுவானாலும் கிட்ட இருந்து ஓட்டினா தான் ஓடறது. வேறு வேலையில் கவனம் இல்லாமிலிருந்தால் விபத்து நடக்கும். ஆனா பகவான் ஞாபகம் இல்லாம ஸ்லோக மந்திரத்தை முணு முணுத்தா போறும்னு நெனைக்கலாமா? இருப்பாள்னு நெனைச்சு தியானம் பண்ணினாலேகருணை செய்கிறவாளாச்சே! கல்லைத் தூக்கி சமுத்திரத்திலே போட்டா மூழ்கிடும். ஆனா மரத்தாலே கப்பல் பண்ணி, அதிலே எத்தனை கல் ஏத்தினாலும் மூழ்கிறதில்லே! கவலைகள் கல்லு மாதிரி,பகவான் தெப்பம் மாதிரி, மனசு என்கிற சமுத்திரத்திலே பகவானைத் தெப்பமாக்கணும். தெய்வத்தை இணைக்கிற ஆணிகள் தான் பூஜை மந்திரங்கள் எல்லாம். அப்புறம் கவலைகளைத் தூக்கி தெப்பத்தில் இறக்கலாம். சம்சாரசாகரத்தில் மூழ்கடிக்கப்படாமல் கரை சேர்ந்து விடலாம். From the book ஸ்ரீ பரமாச்சார்யாள் பாதையிலே â€” ஆர்.பொன்னம்மாள். Thanks for your positive comments . Yesterday I was completely soaked with various devotee's experience with Sri Kanchi Maha Swamigal and the posted incident really shook me . We dismiss day to day pujas to our deities as some thing as routine ritual and then desperately run to Divine men for blessings and Guidance and here Sri Kanchi Maha Swamigal has pointed out that the God in your own Puja altar is sufficient to Guide you if you seek its guidance with full earnestness . I had a taste of this myself few days back when I misplaced an important Document( I have shared it in another thread ) and got back the same after saying my daily prayers with full devotion before the deity .